Q.1 : What is Swachh Bharat Cess (SBC)? Ans: It is a Cess, which is levied and collected at the rate of 0.50% of the value of taxable services in accordance with the provisions of Chapter VI of the Finance Act, 2015. Q.2 : What is the date of implementation of SBC? Ans. The Central Government has implemented levy of SBC with effect from 15.11.2015. Q.3 : Whether SBC is leviable on exempted services and services in the negative list? Ans. SBC is a cess leviable on taxable service only. It is not leviable on exempted services or services in negative list. Q.4 : Why has SBC been imposed? Ans. SBC has been imposed for the purposes of financing and promoting Swachh Bharat initiatives or for any other purpose relating thereto. Q. 5 Where will the money collected under SBC go? Ans. Proceeds of the SBC will be credited to the Consolidated Fund of India, and the Central Government may, after due appropriation made by Parliament, utilize such sums for the purposes of financing and promoting Swachh Bharat initiatives or for any other purpose relating thereto. Q.6 How will the SBC be calculated? Ans. SBC would be calculated on the taxable value of services provided. It can be said for easy understanding that the value on which service tax is levied is also the value on which SBC is leviable. Q.7 : Whether SBC would be required to be mentioned separately in invoice? Ans. SBC would be levied, charged, collected and paid to Government independent of service tax and will be charged separately on the invoice, accounted for separately in the books of account and paid separately under separate accounting code. Q.8 What is the accounting code for deposit of SBC? Q.9 : What is the effective rate of service tax and SBC post introduction of SBC? Ans. Effective rate of service tax plus SBC, post introduction of SBC, would be [14% + 0.5%]. Q.10 : Whether SBC is a ‘Cess on tax’ and need to calculate SBC @ 0.50% on the amount of service tax? Ans. : No, SBC is not a ‘cess on tax’, rather it is a cess on the taxable value itself. SBC shall be levied @ 0.50% on the value of taxable services. Q.11 Whether SBC is levied on all or selected services? Ans. Government has notified that SBC shall be applicable on all taxable services except services which are either fully exempt from service tax under any notification issued or are otherwise not leviable to service tax (i.e. covered by the negative list). Q.12 : Will SBC be leviable also for services under reverse charge mechanism? Ans. Yes, the Government has issued Notification No. 24/2015–ST dated 12.11.2015 to provide that SBC shall also be leviable on services notified to be under reverse charge vide Notification No. 30/2012-ST dated 20.06.2012. Q.13 : How will SBC be calculated for services where abatement is allowed? 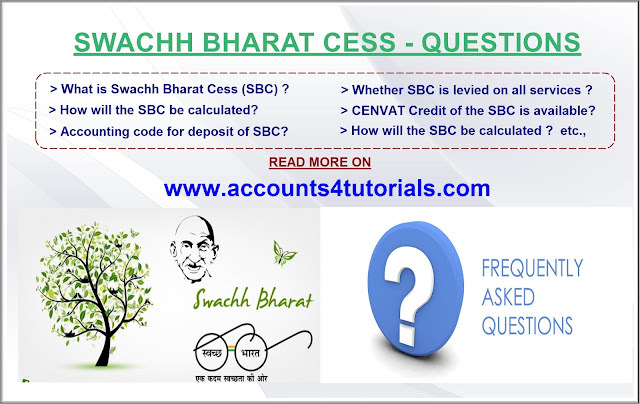 Q.14 Whether Cenvat Credit of the SBC is available? Ans. Credit of SBC cannot be availed. Further, SBC cannot be paid by utilizing credit of any other duty or tax. Q.15 What would be the point of taxation for SBC? or within 14 days i.e. upto 29.11.2015, there is no liability of SBC. In all other cases, SBC would be leviable @ 0.50% of the value of taxable services. Q.16 How would the tax be calculated on services covered under Rule 2A, 2B or 2C of Service Tax (Determination of Value) Rules, 2006? Ans. Tax on services covered by Rule 2A, 2B or 2C of Service Tax (Determination of Value) Rules, 2006, i.e. ‘Works Contract Service’, ‘Money Changing Services’ or ‘Restaurant & Outdoor Catering Services’ would be computed by multiplying the value determined in accordance with these respective rules with [14% + 0.5%]. Therefore, effective rate of Service Tax plus SBC in case of original works and other than original works under the works contract service would be 5.8% [(14% + 0.5%) * 40%] and 10.15% [(14% + 0.5%) * 70%] respectively. Similar, would be the tax treatment for Money Changing, Restaurant and Outdoor Catering services. Q.17: Whether SBC would be applicable on services covered by Rule 6 of Service Tax Rules? Ans. Rule 6 of Service Tax Rules, 1994 prescribes composite rate of tax for services of Life Insurance Business, Money Changing & Distributor or Selling Agent of Lottery. A new Sub-rule (7D) to Rule 6 of Service Tax Rules, 1994 has been inserted vide Notification No. 25/2015–ST dated 12.11.2015 so as to provide that the person liable for paying the service tax under other sub-rules to Rule 6, shall have the option to pay SBC as determined as per the following formula:-ST [calculated as per sub-rule (7), (7A), (7B) or (7C)] X 0.5 %/14 % The option under this sub-rule once exercised, shall apply uniformly in respect of such services and shall not be changed during a financial year under any circumstances. Q.18 : How would liability be determined in case of reverse charge services where services have been received prior to 15.11.2015 but consideration paid after 15.11.2015? Ans. In respect of reverse charge mechanism, SBC liability is determined in accordance with Rule 7 of Point of Taxation Rules, 2011 as per which, Point of Taxation is the date on which consideration is paid to the service provider. Thus, SBC liability in such case will be 0.5% X Value of taxable service. Q.19 : Does a person providing both exempted and taxable service and reversing credit need to reverse SBC also in accordance with Rule 6 of Cenvat Credit Rules, 2004? Ans. No. Reversal under Rule 6 is a payment of CENVAT Credit attributable to such proportion of services as are used for provision of the exempted services and SBC is not integrated in the CENVAT Credit chain. Accordingly, reversal of SBC is not required under Rule 6 of Cenvat Credit Rules, 2004.